The natural boundaries of Teide National Park are marked by a grandiose, spectacular caldera. The Teide-Pico Viejo stratovolcano formed inside this elliptical depression, which measures 16 x 11 km. The name Las Cañadas comes from the plains at the foot of the caldera escarpment, which were used as a cattle route (known as "cañada" in Spanish). The biggest plain is called Llano de Ucanca. The water that descends the walls is trapped inside, and so the materials that are dragged along with it settle and accumulate in the base, forming these plains. The origin of Las Cañadas caldera is a topic of debate, and there are two main hypotheses. The most likely theory is that it has been formed purely by erosion, with a valley that exits on the north face, in the municipality of Icod, which would now appear to be occupied by Teide lava flows. The other hypothesis is that there was a major collapse when a shallow magma chamber spewed out its contents at great speed. However, the most recent investigations into the submarine remains and data obtained from artificial water-collection galleries clearly support the first hypothesis, whereby a gravitational slip towards the north formed Las Cañadas caldera and Valle de Icod, some 198,000 years ago. 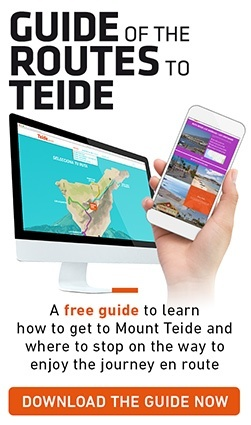 It is estimated that Mount Teide started to be formed about 175,000 years ago. Lava emissions gradually filled the initial depression, and now only the walls remain.